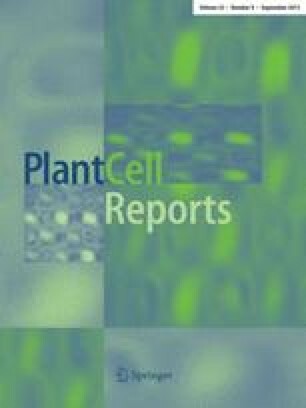 Plant regeneration from protoplasts isolated from embryogenic suspension cultured cells of Cinnamomum camphora L.
An efficient and reproducible protocol is described for the regeneration of Cinnamomum camphora protoplasts isolated from cultured embryogenic suspension cells. Maximum protoplast yield (13.1±2.1×106/g FW) and viability (91.8±3.8%) were achieved using a mixture of 3% (w/v) cellulase Onozuka R10 and 3% (w/v) macerozyme Onozuka R10 in 12.7% (w/v) mannitol solution containing 0.12% (w/v) MES, 0.36% (w/v) CaCl2·2H2O, and 0.011% (w/v) NaH2PO4·2H2O. First divisions occurred 7–10 days following culture initiation. The highest division frequency (24.6±2.9%) and plating efficiency (6.88±0.8%) were obtained in liquid medium (MS) supplemented with 30 g l−1 sucrose, 0.7M glucose, 0.1 mg l−1 NAA, 1.0 mg l−1 BA, and 1.0 mg l−1 GA3. After somatic embryo induction and then shoot induction, the protoplast-derived embryos produced plantlets at an efficiency of 17.5%. Somatic embryos developed into well-rooted plants on MS medium supplemented with 1.0 mg l−1 3-indole butyric acid (IBA). Regenerated plants that transferred to soil have normal morphology.